It’s 7:03 a.m. and time to get out of bed and head to work… Or maybe time to spend a few more minutes under the covers reading your emails. You’ll have to do that at work anyway, so why not get a head start in the comfort of your own home? Yeah, email checking sounds good; way better than getting up. A vacation request from an employee, two new fans on Facebook, someone’s sick and not coming in today – typical stuff. And then you see it: a new comment from Sandy1984 was posted to your page. Cool! Ever since you created your online survey, you’ve noticed a great increase in the amount of customer opinions you hear each day. In fact, you‘ve had such a positive experience up until now that you even decided to have your feedback published automatically to make sure potential customers know what your business is worth. Yet Sandy1984 seems to think your business isn’t worth anything. 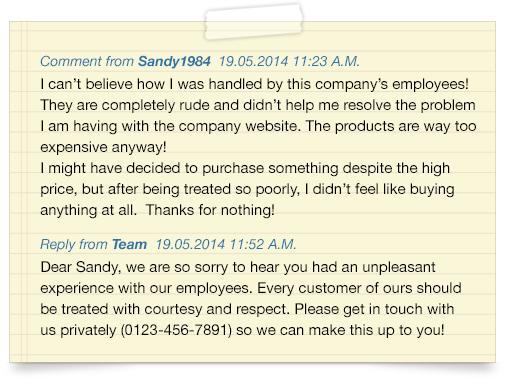 Sandy1984 doesn’t care about potential customers. And what?! Your employees are unfriendly and unhelpful? Your products are too expensive? Who does she think she is? By now, your heart is pumping so fast you feel like it’s literally trying to escape your chest. The fact that you stayed in bed so long is making you feel like you’ve already wasted so much precious time. You justifiably feel protective of your hard work; of your brand. You jump out of bed and sprint to your car like a mad man. You need to tell everyone about what happened! Once you’ve finally found your colleagues at work, you recite Sandy’s comment to them, leaving out no opportunity to exaggerate. After taking an hour to rant, you collectively come to a very important decision. Things can go one of two ways. Just kidding, but it won’t turn out well for you, which is why we’re just going to skip this part. You might have a chance of convincing those potential customers that you’re still worth their money and attention. Moreover, you might even have a chance of winning Sandy1984 back. Not all negative comments are actually bad! If you’re smart about it – it’ll work out in your favor, as it will show your customers/guests that you’re real. They won’t just see the business anymore, they’ll see the people behind it. Now it’s time to get down to the nitty gritty. 1. Make sure you’re in a rational state before you write back. Yes, customers can be mean and bossy, but they’re also very important to your company. Publicly criticizing those who give you negative feedback will not make you look good, even if your comeback is witty. We’ve all seen the ‘sore loser’ comments before. They’re just not pretty. You’re still angry and really don’t feel like kissing up to someone who bashed your brand. Understandable, but think about how dangerous one negative review can be. Make amends by simply apologizing. The best and most-used phrase to do so is: “We’re really sorry to hear that.” This does not mean you should grovel or beg for forgiveness, but saying sorry can go a long way. Most customers/guests believe that companies don’t care about them or won’t even read their feedback anyway, which can lead to some overreacting. Once you apologize, customers will be pleasantly surprised by your behavior; maybe even a bit embarrassed for being so negative. Appeal to other customers which are wearily reading this nasty comment by offering your sympathy. Say something like, “You shouldn’t have been treated that way,” or, “We really don’t like hearing that you’re unsatisfied.” It’ll show the angry customer (and all of those reading his/her comment) that you care about their frustration and that you’re able to empathize with their situation. Action speaks louder than words! Merely apologizing to a customer will get you brownie points, but it won’t get you back their business. Reflect on what the problem is really about. It might be the best choice to offer them a refund or take the extra step and contact them personally. If you go the extra mile, angry customers will very likely turn into loyal customers that tell their friends about how great your customer service is. If you’re quick about it and show that you really do care about your customers, you’ll be able to convince readers of your service quality. That’s something rare nowadays. Customers will notice it. Sandy seemed to notice! As soon as you replied to her angry comment with your understanding explanation, she got in touch with you and gladly accepted your offer for a 15% discount. She was also able to tell you which employees were unfriendly, giving you the chance to ask them about their behavior. Sandy then told her friends about your excellent customer service, who then told their friends, and so on, and so forth. Sometimes going the extra mile to keep customers happy literally pays off! 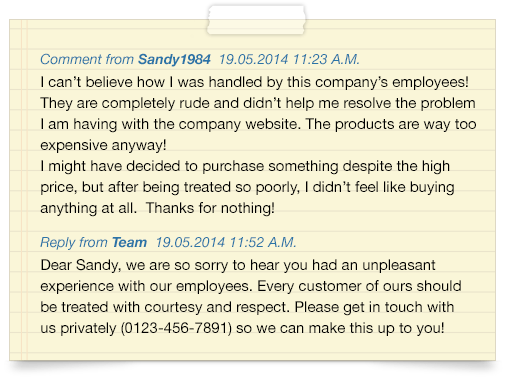 This is what happens if you do or don’t respond to negative customer feedback.